According to TechNewsWorld, Adobe is expanding their market by now offering a mobile version of Lightroom for Android devices. Last year they released the app for iOS mobile devices. It does not provide the full functionality of the desktop version; however, it allows users to save changes to their photos and sync them back to their desktop. For more information Lightroom for mobile devices, visit Adobe’s website. This brief tutorial shows you have to take a 5-10 second video and convert it to a GIF with Adobe Photoshop. Lightroom has tools built in that allow users to quickly and easily correct lens distortion and vingetting in images. Lenses have distortion because the light “bends” as it enters the front glass, so when it hits the sensor of the camera, it spreads the edges just a bit. Thankfully, digital photography has allowed us to easily fix this distortion. Most images come in specific sizes, where the file contains each pixel’s information. This means that when a user scales the image to be larger, the program “fills in” the missing information, often making it look blurred or pixelated. A solution to this is a vector image, which contains mathematical expressions instead of pixel data. It uses those expressions to “build” the image, and since it isn’t pixel-dependent, a user can scale the image to be larger or smaller while keeping the lines clean and crisp. An easy way to convert an image to a vector format is to use Illustrator’s Image Trace. With one button, a user can have a vector image from any source format. Introducing Feature of the Week, where we highlight a feature of a program and give a basic tutorial on how it works. This week we’re focusing on Camera RAW in the Adobe Creative Suite. Camera RAW is one of the single most powerful tools in a photographer’s arsenal, and often one of the most overlooked tools in the Adobe Creative Suite. It gives the user extensive control of the post processing of an image, allowing them to edit exposure and distortion before going into Photoshop to make more advanced edits. Adobe Bridge is a digital asset management software that allows a user to organize any kind of media. The name Bridge comes from the idea that Adobe Bridge will be the link between all of the programs in the creative suite. From Bridge a user can drop an Illustrator vector image into Photoshop, or an After Effects video into Premiere. This tutorial covers the basic interface of Adobe Bridge, from selecting images, to the filmstrip view, to reading the metadata of a file. University owned computers can download any of the Master Collection Adobe Creative products via LANDesk. For more informaiton, visit our service page http://www.smu.edu/BusinessFinance/OIT/Services/Info/Adobe. Long time users of Photoshop can look at the icon of any tool on the Photoshop toolbar and tell you exactly what you could use it for, but chances are, the average user only knows what a handful of these tools do. The Photoshop Toolbar makes up almost 80% of anything you could ever need to do in the program, so below is a rundown of most of the tools. *Tip- Any tools with a small triangle in the bottom right hand corner has more tools hidden underneath. To reveal, simply click and hold until the hidden tools appear. In the first box are the Selection tools. These allow you to manipulate layers and select objects. The Move tool lets you move objects in the selected layer. To use it, just click and drag. The Rectangular Select tool lets you select areas of a picture, a rectangle by default. To make a perfect square, hold the shift key while drawing the shape. By using the context menus across the top of the screen you can make any shape you want. The Lasso tool allows you to trace the shape of an object and the line will adhere to the hard edge of your object. The Crop tool lets you cut parts of the picture out. It’s useful if there is something on the edge of the frame that you don’t want there. The Eyedropper tool helps you to match color in specific parts of the image. Just click on a pixel and it will add the color to your paint swatches. The Spot Healing tool allows you to remove blemishes from pictures, including red eye, acne, dust, and other particles. Photoshop will sample around the area and make it blend in. The Clone stamp tool duplicates part of an image onto another spot in an image. It’s useful if you want to reposition something, like moving a soccer ball closer to a player in an image. The Gradient tool creates a gradient to cover a whole image from foreground to background. You can use your own colors or choose from Photoshop’s presets. The Blur and Sharpen tools both act like paintbrushes but have different effects on your photo. The Blur tool allows you to blur parts of the photo, and you can choose the strength of the blur, the style, and how much it feathers. The Sharpen tool will remove unnecessary pixels and make the area look sharper. The Type tools allow you to add and manipulate text or shapes in an image. The most commonly used of these is the Text tool which lets you type into an image and create text masks. To learn more about Photoshop and how to use it, check out Adobe TV. Or, to learn more about downloading Adobe CC on your University owned computer, visit our service page. I can hear the thunder. 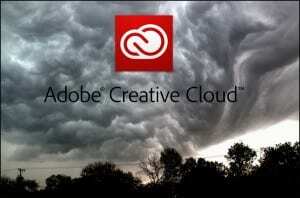 Adobe Creative Cloud is almost here! This fall we will be updating from Adobe CS6 to the most current CC (Creative Cloud). Aside from getting the most updated version of Creative Suite, SMU machines also get a host of other goodies, like Muse, After Effects, and Premier Pro.